This past spring my good friend John Bertolini came down for a visit and not only brought along his lovely wife but also his collection of 40mm 'Old School' mid-19th Century soldiers. 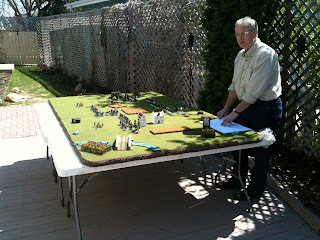 This was great in of itself but it was made even better as John has sculpted and cast all of these miniatures himself. 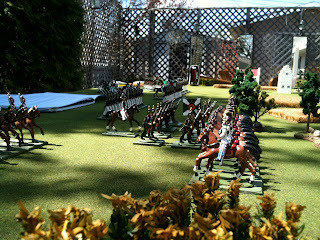 The style is very reminiscent of the 'semi-round' toy soldiers that you would see in Europe from the turn of the century. They are quite charming, with those classic proportions you see in figures from this era (i.e. exagerated features , wasp-waisted and with pidgeon-chests). John has completed the traditional feel by painting them in the classic high varnish style. I really love the look of these figures, especially when they are arrayed en masse. 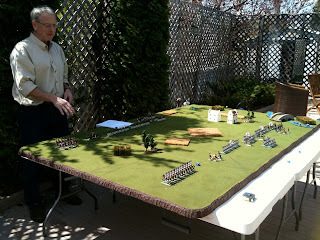 John is unpacking his lads and giving me a brief of the scenario and rules. 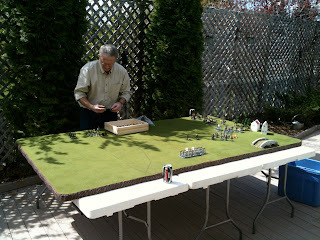 It was a spectacular spring day so we set up the game outside on the deck. 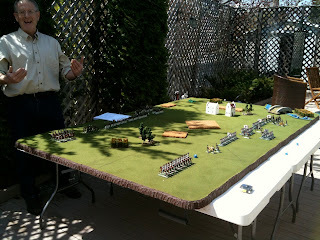 I think the rules we used were 'Ever Victorious Armies' or something like that. 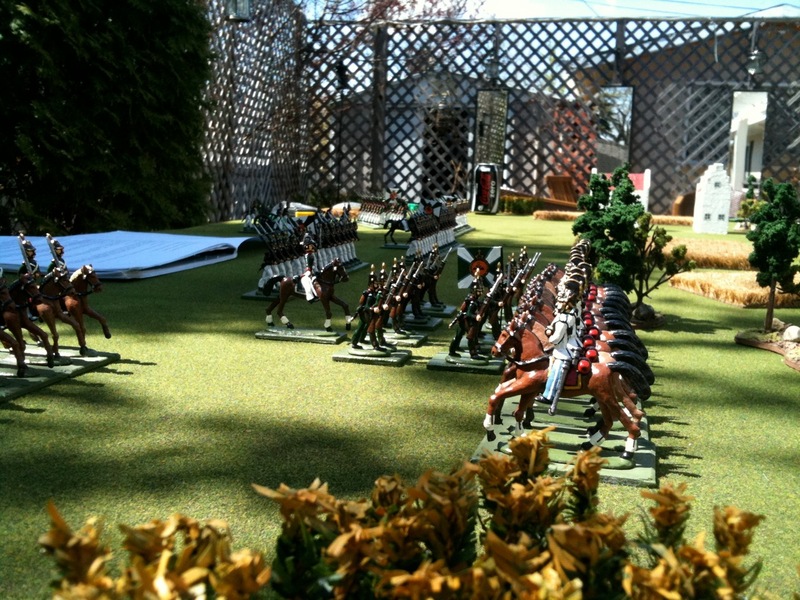 It makes no matter as we had a great afternoon moving great schwaks of lead soldiers around a table, enjoying the sun and gossiping about the hobby (actually I'm not even sure who won). Perfect. Now, how cool are these cavalry! 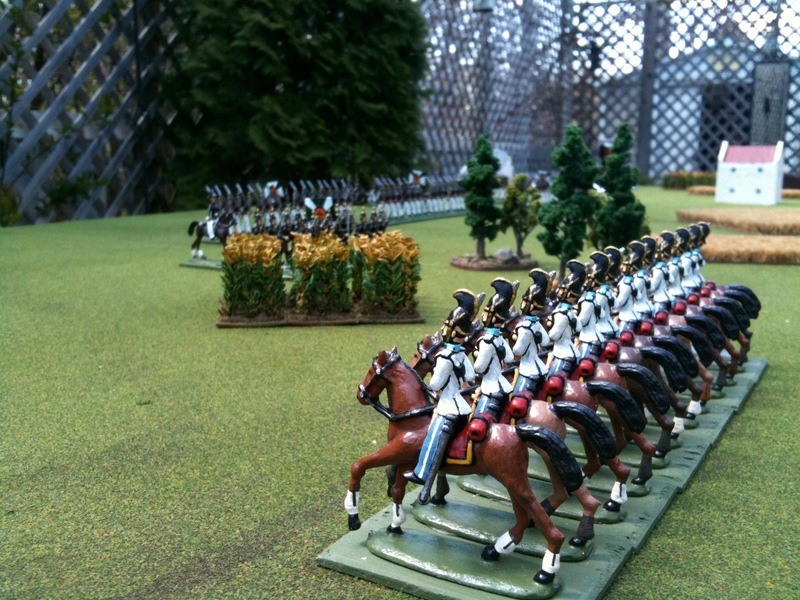 I believe John is thinking about beefing up these regiments with even more castings which will be brilliant. The table will veritably groan under the weight of it all! If it's the game I remember him talking about I think you won... but I totally understand the sentiment. There are certain people that I've gamed with that it's just fun and they're there to have a good time and play a game that's... well... "interesting"(?) and winning or losing is never really an issue. The spirit is more of a "lets see what happens" and would never think of doing anything with their troops that cheir particular troops would never have done (whether it's "allowed" in the rules or not). I never remember who won, and I couldn't care less. John is certainly one of them. Others, not so much... I think some people actually see the game as a sort of "test" of their "military prowess" or something (when it's actually just their ability to find "clever" ways of doing things according to the rules - whether they have an bearing on reality - or their ability to design a "killer army"). I do seem to remember who one those. It invariably isn't me - probably because I just don't give a crap enough to find fiddley bits in the rules that can be abused or can crunch the numbers enough to design a "killer" army... I try to play with them less these days. Thanks for your comments, Tim! Yeah, as I get older I have less inclination to have anything to do with 'power gamers' - its just not my scene. 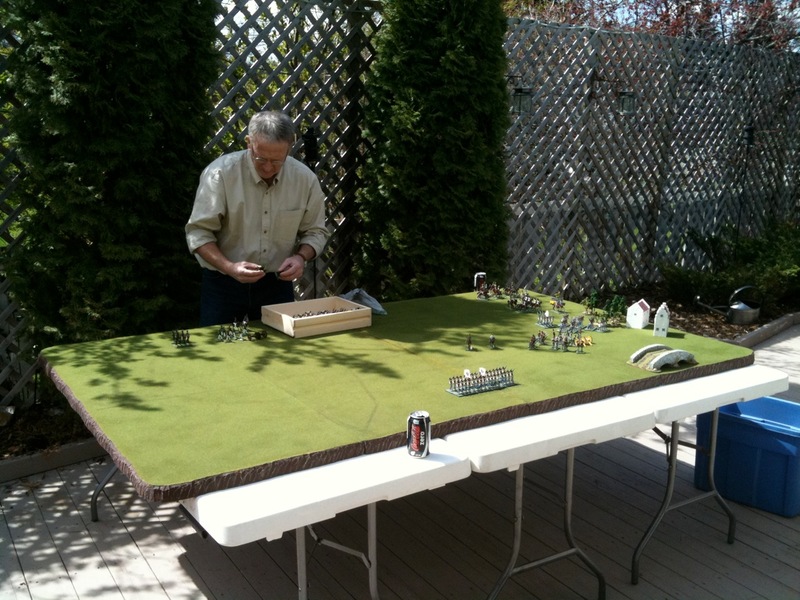 To me its the research, the preparation, the spectacle and the company that makes the hobby so fulfilling. The technical result of the 'game' itself is basically immaterial next to the event itself.